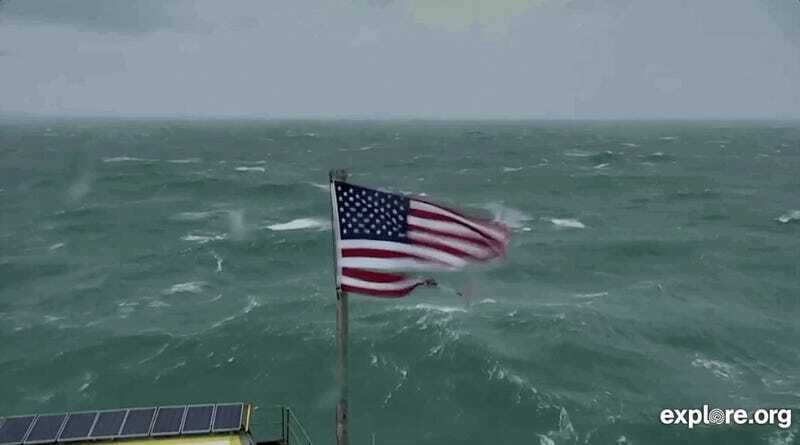 High winds have shredded the American flag and the high seas are rocking at the Frying Pan, located 34 miles of the North Carolina Coast. 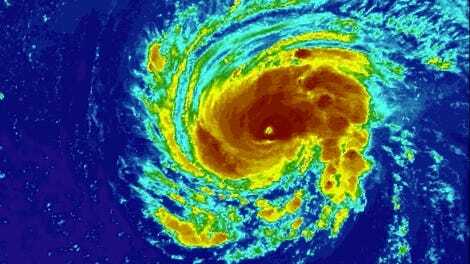 Florence is a super-sized, powerful Category 2 hurricane with tropical storm-force winds extending 195 miles out from its core. Because of its prodigious size, the storm has yet to make landfall, but its winds have neverthless whipped the ocean into a frenzy. Those winds can heard howling at the Frying Pan, a decommissioned lighthouse 34 miles off the North Carolina coast. It’s the start of what will be a hellacious few days as Florence moves ashore at a crawl and then cuts inland. Storm surge is expected to reach up to 13 feet, inundating coastal lowlands. That soggy ground also means that winds will have an easier time toppling powerlines and leading to outages. Paige Sheehan, a spokesperson for local utility Duke Energy, told Earther on Wednesday that the company had 20,000 workers at the ready to restore power, but that it was warning customers they could be without power for weeks. The storm means business. We’ll be watching it closely and updating this post periodically. Earther also has a handy list of tools you can use to track the storm, whether you’re in harm’s way or watching from afar. Update 9/13 3:45 p.m. ET: Right now, the biggest issue with Florence is storm surge. Water pushed ashore by Florence’s winds is cutting through the barrier islands of the Outer Banks and slamming into the coast. The images are dramatic and the surge is only going to get worse as the storms moves ashore. Update 9/13 4:06 p.m. ET: The hurricane force winds have arrived. A buoy near Wrightsville Beach (no tie to the Wright Brothers) recorded a gust of 76 mph, just a smidge over hurricane force. The graph below also shows air pressure dropping like crazy, an indicator that more powerful parts of the hurricane are coming ashore. And yet Florence’s eye is still well out to sea. Things are only going to get more wild from here. Update 9/13 9:02 p.m. ET: The hurricane-force winds have arrived. Cape Lookout in the Outer Banks recorded sustained winds of 83 mph with gusts topping out at 106 mph, which are Category 2-level winds. In that same report, the National Hurricane Center noted that a few other privately operated stations are reporting hurricane-force sustained winds and gusts as well. Florence continues to scoot towards the shore and may have picked up a little steam from feeding off of the warm Gulf Stream. Those winds and accompanying storm surge are also knocking out power and becoming extremely dangerous. A live feed set up by hurricanetrack.com and being broadcast by Pattern in New Bern’s Union Point Park on the banks of the Neuse River captured the moment the lights went out in town. Residents there are among the more than 100,000 who have reportedly lost power. According to Accuweather, that includes every customer in Pamlico and Carteret counties. And the dangers of storm surge forced WCTI meteorologists to evacuate on-air, leaving an eerie radar loop of Florence as they left the studio. When the meteorologists evacuate, you know things are getting hairy. We’re up to more than 150,000 without power in North Carolina and Florence is still rumbling ashore. There’s “significant flooding” occurring on rivers according to the National Weather Service. And winds are really starting to rip. And we haven’t even really begun to see the heavy rains Florence has in store for the Carolinas. Update 9/14 7:50 a.m. ET: Florence has officially made landfall as its center moved ashore near Wrightsville Beach. The National Hurricane Center estimates that its central winds are 90 mph, but some locations are seeing higher gusts. The eyewall is hitting Wilmington just a few miles west from Wrightsville Beach and the videos are harrowing. Meteorologists on the ground are reporting gusts in excess of 90 mph, indicating Florence is packing a major punch. It should go without saying but do not try this at home. It appears some locations are already inside Florence’s eye as well. The eye is literally the calm at the center of the storm where winds drop to a whisper. It is freaky, but also a welcome temporary reprieve for those in Florence’s path. Update 9/14 8:20 a.m. ET: If you’ve kept an eye on Twitter during the run up to Florence, there’s a good chance a Weather Channel visualization of storm surge hit your timeline. If you haven’t watched it, I’d urge you to. I’ve studied and written about this stuff for a decade, and it hit home for me in a very visceral way. Storm surge is a true force of nature. This is why there were mandatory coastal evacuations. Update 9/14 10:35 a.m. ET: The next time you get mad that it’s raining out and the forecast called for sun, remember this. 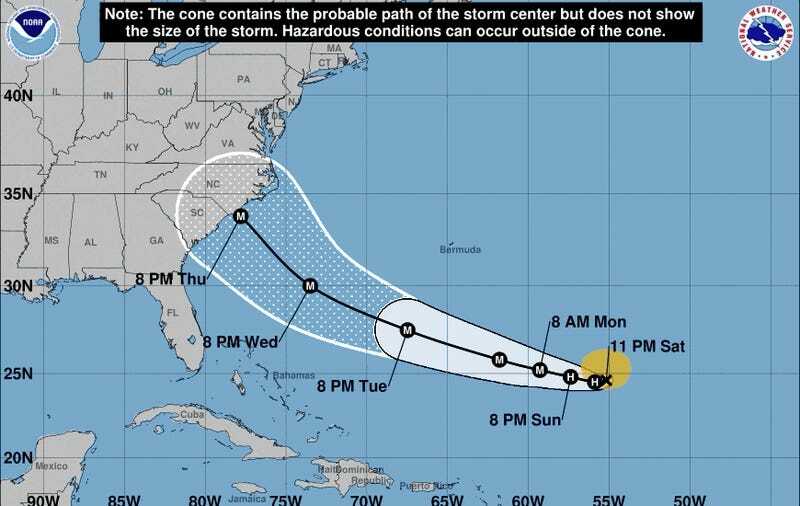 The National Hurricane Center absolutely freaking nailed the Florence forecast. The Sunday forecast—five days before Florence’s landfall when the storm was nearly 1,500 miles out to sea—called for landfall on the northern portion of Wrightsville Beach. Fast forward to this morning and the hurricane made landfall two miles south. That’s what I call pinpoint accuracy. Once the forecast locked in on North Carolina, it stayed there. Update 9/14 11:25 a.m. ET: Once again, astronauts have the best view of Florence. Insulated from the fury of the storm and with a birds eye view, the Space Station affords a unique perspective of the fury Earth can unleash. Luckily we can also catch a glimpse of what they’re seeing from an HD camera mounted on the Space Station, which captured Florence minutes after landfall on Friday morning. The view is a bit vertigo-inducing, but well worth your time to truly understand the scale and size of this storm. Update 9/14 11:50 p.m. ET: Water rescues are happening just as high tide hits. Rescue workers are using boats and high clearance vehicles to respond to people stranded in the floodwaters in James City, which sits next to New Bern. That’s where some of the most dramatic footage of Florence’s flooding has come from. Swift Creek—just upstream of New Bern—is currently in major flood stage according to the National Weather Service. The images emerging of first responders putting people in boats and ferrying them to safety are surely the first of many. Update 9/14 1:28 p.m. ET: Sure, I may be biased, but when I need lifehacks, I visit Lifehacker. And with Florence, there’s no shortage of hacks to be had. Our pals over there have an exhaustive collection of blogs that can help you understand the storm, find refuge if you’re trying to get out of the way, and how to help from afar. Update 9/14 3:17 p.m. ET: There is a lot happening across North Carolina right now as rain and flooding spread inland. So far there have been nearly 644,000 power outages and more than 100 swift water rescues according North Carolina’s Department of Public Safety, which is providing updating information in real time. “This morning at 3:24 am EDT, a storm surge of approximately 5.51 feet was recorded at the Beaufort gauge. Fortunately, the tide was receding rapidly at that point, but the storm tide (the combination of the surge and tide) still set an all-time water level at the gauge near 2 am: 3.74’ above the high tide mark (Mean Higher High Water, or MHHW). As Henson notes, the record couldn’t have happened without climate change. Sea levels have risen a little more than 8 inches since Hurricane Hazel in 1954, which caused the previous record setting surge. The Cape Fear River at Wilmington also just set a new high water mark, besting a record set just two years ago during Hurricane Matthew. It’s an unpleasant reminder sea level rise is creating a flooding crisis. Local police in Wilmington also confirmed the first two fatalities from Florence, and major news outlets are reporting there may be up to four deaths. We’ll keep an eye out for more confirmation. Members of the FEMA Urban Search and Rescue Task Force 4 from Oakland, California, search a flooded neighborhood for evacuees in Fairfield Harbour, North Carolina. Update 9/14 4:58 p.m. ET: The National Hurricane center has downgraded Florence to a tropical storm as it staggers like a drunkard inland. But despite the “downgrade” from hurricane to tropical storm, it still packs a major punch. The storm is moving at a whopping 3 mph, enough for a brisk New York walker to do laps around. As a result of the slow movement and still expansive windfield, storm surge is expected to continue sloshing around. Up to 12 feet is expected on the Neuse, Pamlico, Pungo, and Bay Rivers. Some areas have already seen 20 inches of rain and Florence’s plodding pace mean those totals will continue to climb big time. It’s only a matter of time before the state’s rainfall record falls. Update 9/15 2:00 p.m. ET: “Catastrophic” rainfall continues throughout much of southeast North Carolina, with 15 to 30 inches of rain reported in some areas and up to 15 more expected, according to the Washington Post. According to rainfall reports posted by the National Weather Service, Swansboro saw over 30 inches of rain. If confirmed, that would shatter the state’s previous tropical rainfall record of 24 inches during Hurricane Floyd in 1999, Accuweather wrote. Satellite imagery from NOAA shows that the storm is now slowly moving inland. Evacuation orders in parts of South Carolina have been lifted, according to Accuweather, but police are warning citizens in Cumberland County, the City of Fayetteville, and the town of Wade to evacuate due to surging river levels.